Cavalor Pow'red Performance provides the nutritional support necessary to allow a horse to reach his top potential. Cavalor Pow'red Performance is a premium supplement designed to help a horse cope with the demands of intense training. The key to the efficacy of this product is the precise ratios of ingredients and high quality Vitamin C. The iron in Cavalor Pow'red Performance is supplied in a natural way, which will help increase the number of circulating red blood cells, without the risk of iron toxicity. 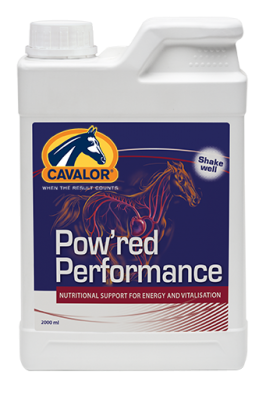 Cavalor Pow'red Performance can be fed for the entire competition season, or used at times of increased demands- the beginning while fitness is being established, or the end when the horse is tiring.